Hey There, A beautiful day ahead to all my readers!!! He is called “Labrador in hooves,” which is a giant and gentleman. He is truly a very rare and unusual storybook stallion. Frederik described as the one with Power, Beauty, Elegance, Nobility, and very Showy. 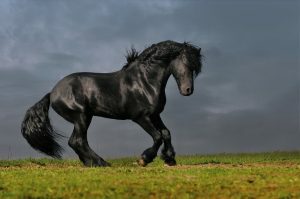 The Friesian breed comes from a long line of performance specializing in active gaits and powerful trots. 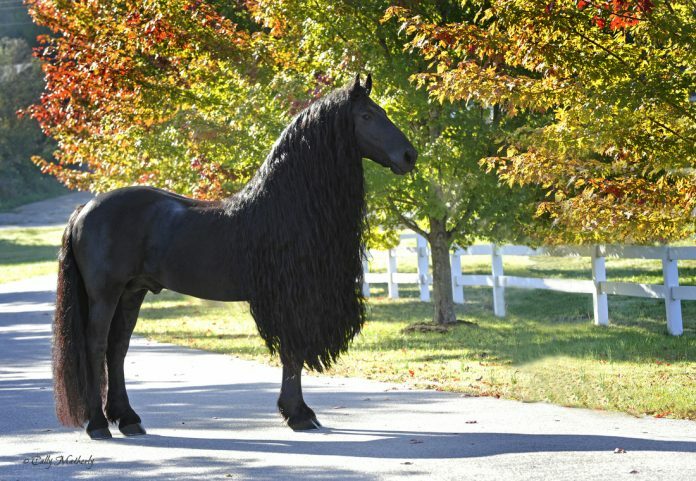 The athletic stallion FABE348 was the Reserve Champion of Stallion 2000 and grandsire of the patriarch of Friesian’s MELLE 311 sport holding reserved title, KFPS Stallion Show World Champion. The great Fredrik got registered with KFPS and FHANA and Fredrick received the very top class of 1st premier at the stallion inspections in the Netherlands. The Keuring scores to 30%, 35% and 40% on confirmation considered optimum on the FHANA and Dutch linear score form. It is 100% the great black homozygous has a very low 1.17% kinship. Fredrik’s walk at 7.0 and trot at 7.5, height is 16’1” hands. Fredrik earned the recognition of Dressage Grand Champion in 2007 at the famous Woodside Expo in California. In 2008 he won Supreme Stallion in hand and halter, trained 4th level Dressage and is continuing with his training. “The Great Frederik” is available to perform shows, promotional advertising, media, movies, commercials or professional photo shoots. Contact Stacy Nazario at [email protected] You check out much about Frederik on the official site pinnaclefriesians.com. Previous articleVolvo Cars New Target to Sell 1 Million Electrified Cars by 2025.